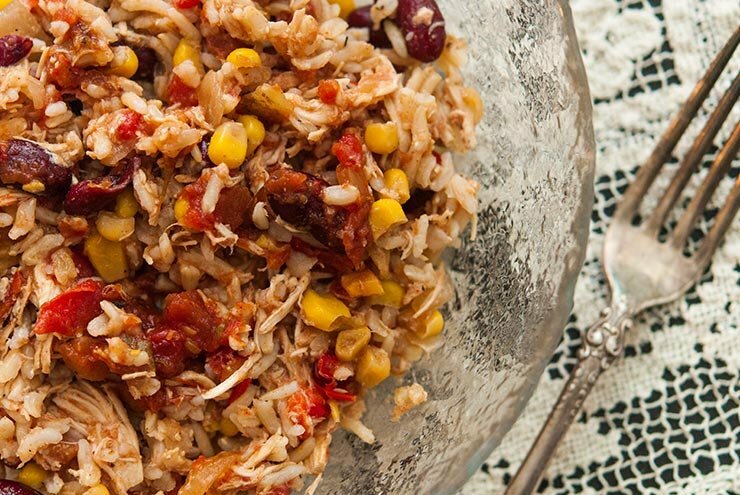 This crock pot Santa Fe chicken is packed with 7 different veggies, spiced with zesty, Tex-Mex flavors and serves at least 6 happy cowboys. It’s also gluten-free and dairy-free! It takes only 30 minutes (or less!) to prepare your ingredients, then all you have to do is sit back and wait for your crockpot to fill your home with the dreamiest aroma. My favorite kinds of recipes for get-togethers with friends are make-ahead meals so I’m not toiling in the kitchen until dinner. I can just place a pot on the stove, serve a few cocktails, then simply heat up dinner when folks are getting hungry. This Santa Fe chicken is such a perfect meal for a movie night with buddies or causal, cozy poker night. Not to mention, an inexpensive meal (even when all ingredients are organic!) 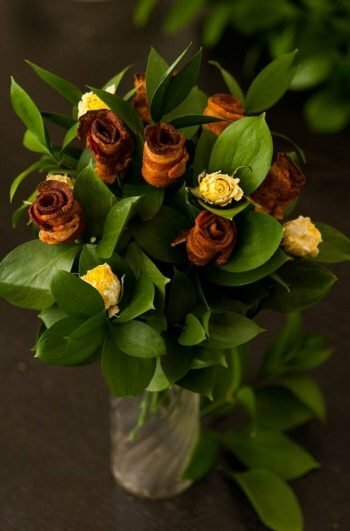 for the whole family. It can be served right away or frozen for months! Essentially, “Santa Fe”- style cooking is traditionally defined by its spices and ingredients such as shredded meats, beans, peppers, corn, onion and tomatoes. 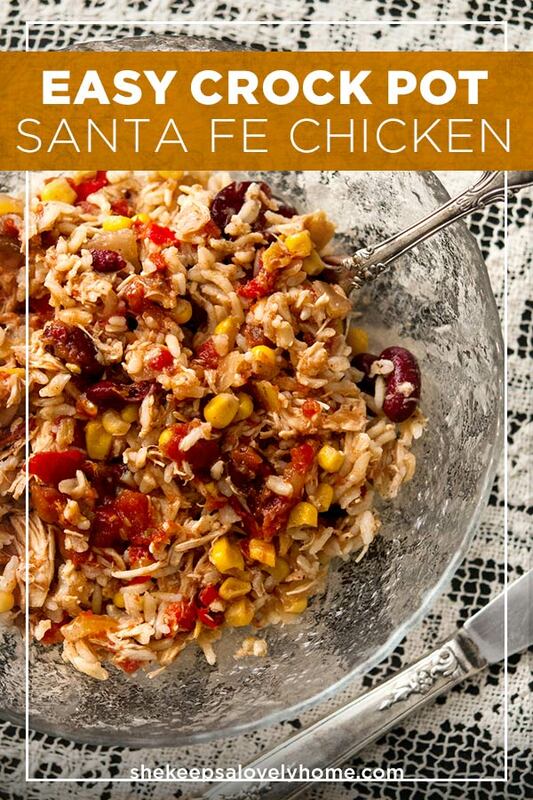 You’ll find that most recipes for Santa Fe Chicken are entirely different – some are baked, some are cooked in a skillet, some include cheese or are served as a casserole. But what you’ll find in common between every recipe, is they almost all include the same ingredients with just a few variations. This recipe contains no dairy which makes it a little different than other recipes that often contain cheese. But by all means, grate some cheddar or sprinkle it with some tasty cotija cheese if you’re feeling cheesy! How Should I Serve Santa Fe Chicken? I like to serve it just as it comes, like a stew, but you can spoon it into tortillas or even use it to make some very impressive nachos! Simply strain the chicken broth, pile it on top of your chips, cover with grated cheese and bake for 20 minutes at 375. The spiciness of this recipe is a mild-medium. If you want to give it a little more kick, add another ½ teaspoon of cayenne pepper (or more!). You can also add a teaspoon of your favorite hot sauce or ¼ cup of your favorite spicy salsa to add a little more spicy excitement. 1. Add 1 cup of basmati rice to 1½ cups of water to a pot (or as directed for 1 cup of rice on your package). Simmer while you prepare your other ingredients. You won’t be adding your rice to the crock pot until it’s just about done, otherwise it just turns to mush. Once finished, simply place it in a container and refrigerate until your chicken is done. 2. – 4. Chop your peppers and onions and add to your crock pot. 5. 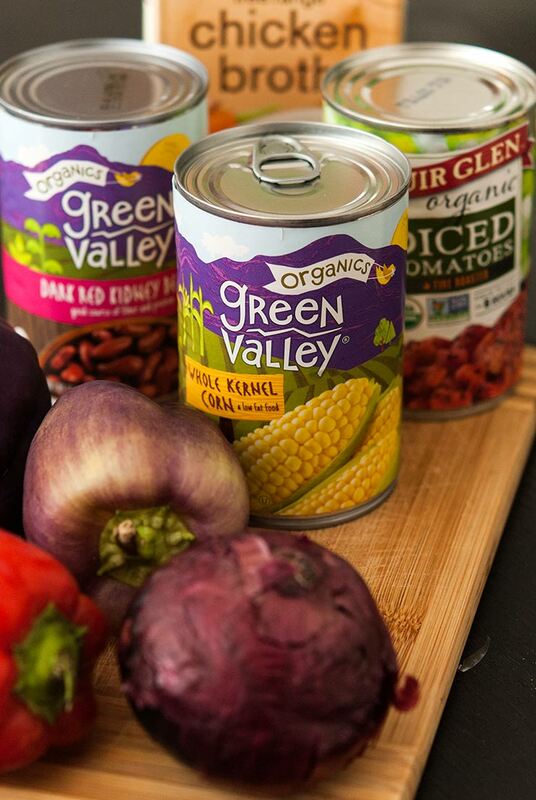 Add your cans of corn, diced tomatoes and kidney beans to your crockpot with your diced onions and peppers. 6. In 1½ cups of organic chicken broth, mix your garlic powder, onion powder, chipotle chili pepper, cayenne pepper and sea salt (a teaspoon of each spice), and pour into the crock pot. 7. Place your chicken breasts on top of the vegetables and season with a little salt, pepper and garlic powder. Set the crock pot to “low” and leave for 9 hours. 8. After 9 hours, remove the chicken breasts, and simply shred them on a cutting board with 2 forks. 9. Pour your refrigerated rice and the shredded chicken back into the crock pot, give it a nice stir, turn it to “High” and cook for another 30 minutes. Serve or refrigerate in a covered container. Add 1 cup of basmati rice to 1½ cups of water to a pot (or as directed for 1 cup of rice on your package). Simmer while you prepare your other ingredients. Once finished, simply place it in a container and refrigerate until your chicken is done. 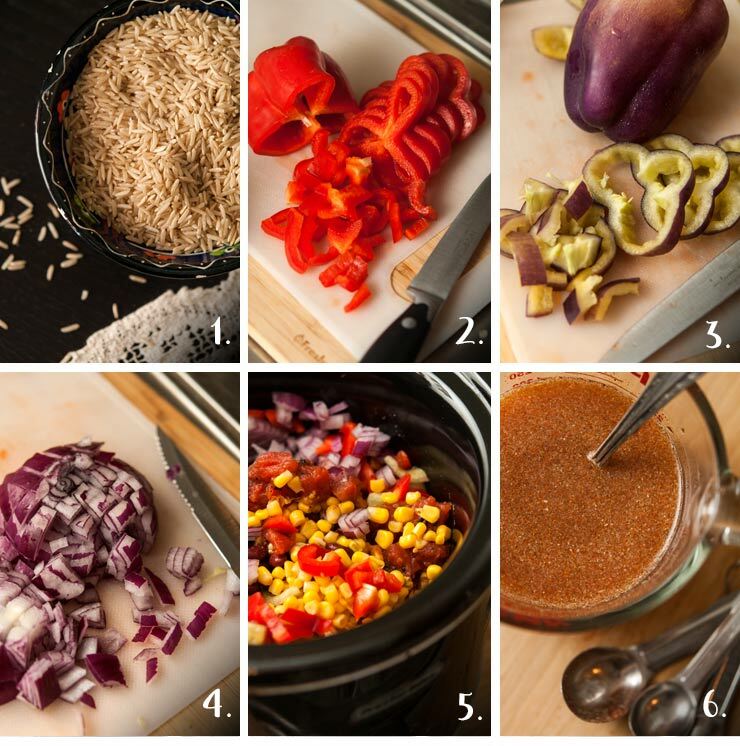 Chop your peppers and onions and add to your crock pot. 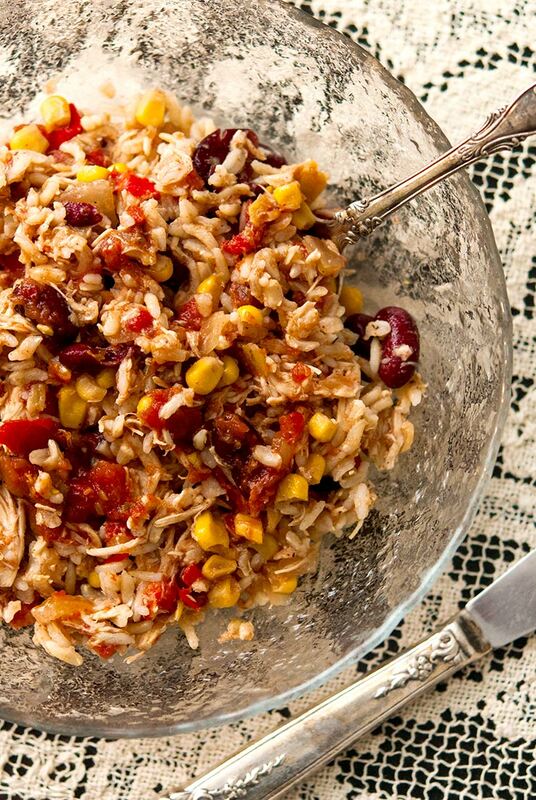 Add your cans of corn, diced tomatoes and kidney beans to your crockpot with your diced onions and peppers. In 1½ cups of organic chicken broth, mix your garlic powder, onion powder, chipotle chili pepper, cayenne pepper and sea salt, and pour into the crock pot. Place your chicken breasts on top of the vegetables and season with a little salt, pepper and garlic powder. Set the crock pot to “Low” and leave for 9 hours. After 9 hours, remove the chicken breasts, and simply shred it on a cutting board with 2 forks. 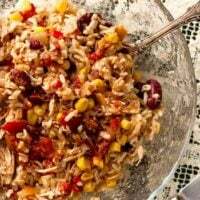 Pour your refrigerated rice and the shredded chicken back into the crock pot, give it a nice mix, turn it to “High” and cook for another 30 minutes. Serve or refrigerate in a covered container. • A cutting board and sharp knife for chop’n veggies.